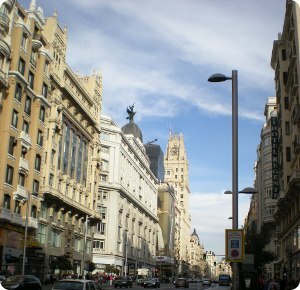 Probably, Gran Vía is the most famous and popular touristic street in Spain. It was mostly dedicated to entertainment with many cinemas, theaters, musicals, night clubs and bars. The construction of the Gran Vía Avenue started in 1910. 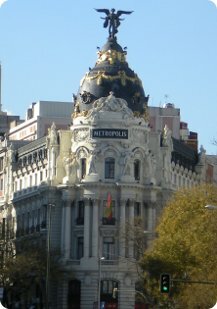 Gran Vía ends to the west in Plaza España Square and to the east at the intersection with Alcalá Street. Permanently crowded with shoppers and sightseers, the street is appropriately named "the great lane" with splendidly quirky Art Nouveau and Art Deco facades fronting its banks, offices and apartments, and huge posters on the cinemas. During the 1920's, the Gran Vía became an area where inhabitants could stroll around, with many shops, insurance company offices and leisure buildings that combined cinemas, theatres or varieties. The first section, approximately up to Callao Square, is characterised by monumental buildings influenced by a modernist style and based on classicism and neo-Mudejar. • The Metropolis Building is one of the most representative constructions. • The Telefónica Building is another prestigious construction. 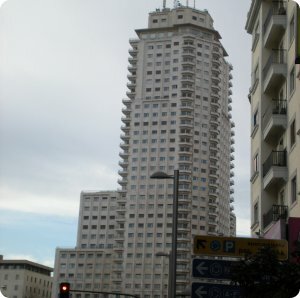 When it was inaugurated in 1929 it became Madrid's first skyscraper, and thanks to its 81 metres it could be contemplated from anywhere in the city. • The Capitol. This multi-purpose building was to house a large amphitheatre that would act as opera house, concert hall and varieties hall, and a commercial area topped with cafés and restaurants, offices, flats and a hotel. 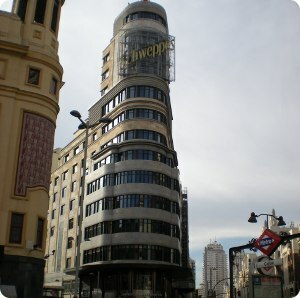 • Callao Square holds a high concentration of movie theaters; most notably the 1920's Palace Press and the Music Palace. From Callao, two pedestrian streets lead directly to Puerta del Sol, for example Preciados Street. • The Gran Vía ends in an open area, Plaza de España Square, created in the 1920's to air the old city and constructed on land occupied by low houses, small gardens and billeting. Plaza de España is one of the biggest squares in the city. The massive Plaza de España is flanked by Madrid's first skyscrapers, built in the 1950's: Madrid Tower and Spain Building. * Lines 1, 5 - Gran Vía station. * Lines 3, 5 - Callao station. * Line 2 - Santo Domingo station.